In working with a financial advisor, Millionaires consider transparency second only to honesty and equally as important as investment track record, according to wealth level studies conducted by Spectrem Group. vBy this criteria, Fidelity scores highest among Millionaire investors. Transparency, also known as “full disclosure,” is defined by the extent to which investors have ready access to any required financial information about a company, such as price levels, market depth and audited financial reports, according to Investopedia. Fidelity calls transparency “a core value.” Among its services along these lines regarding investments is its monthly Equity Summary Score, which provides a consolidated view of the ratings from a number of independent research providers on Fidelity’s website. Eight-in-ten Millionaires consider Fidelity to be the most transparent and trustworthy company, followed closely by Vanguard (79 percent) and Charles Schwab (77 percent). T. Rowe Price ranks fourth among Millionaire investors for transparency and trustworthiness (70 percent). 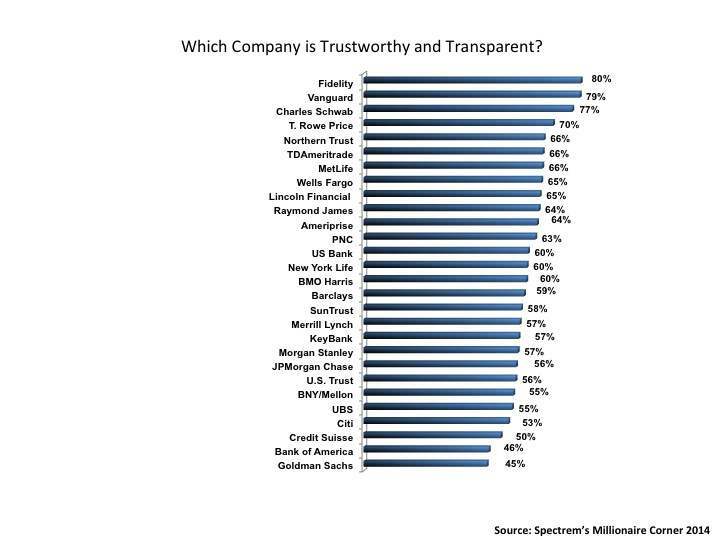 Two-thirds of Millionaires rank Northern Trust, TDAmeritrade and MetLife as the most trustworthy and transparent. Fidelity also ranks tops among Millionaires as the financial provider with the most expertise in managing money, has the most talented advisors and staff (tied with Vanguard), and, among Baby Boomers and seniors, most appeals to their age demographic. Privately held for nearly 70 years, Fidelity has assets under administration of $5 trillion, including managed assets of $2 trillion as of Jan. 31 of this year, according to its website.